The air and water show will go on rain or shine. Gates will open regardless of the weather. However, some acts may not perform if weather conditions do not meet minimum safety standards or visibility requirements. All aircraft appearing and times are subject to change due to various reasons beyond our control, including but not limited to: military operational schedules, maintenance, weather, low ceilings, below-minimum visibility, or any other factor as determined by the promoter. We appreciate your understanding. “America’s Ambassadors in Blue”. 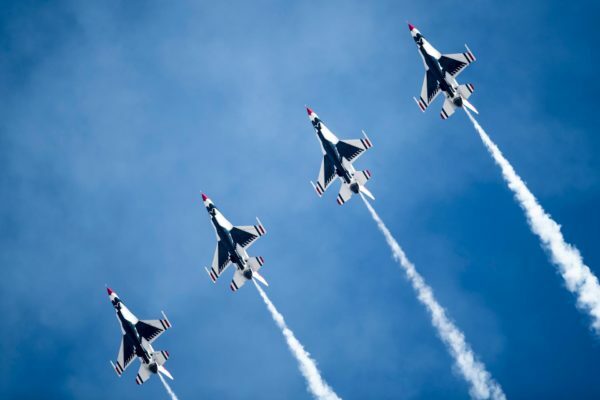 The Milwaukee Air & Water Show is proud to host the 2018 USAF Thunderbirds! The squadron’s mission is to plan and present precision aerial maneuvers to exhibit the capabilities of modern, high-performance aircraft and the high degree of professional skill required to operate those aircraft. The Thunderbirds squadron is an Air Combat Command unit composed of eight pilots (including six demonstration pilots), four support officers, four civilians and more than 100 enlisted personnel. Thunderbirds air demonstration is a mix of formation flying and solo routines. The four-jet diamond formation demonstrates the training and precision of Air Force pilots, while the lead and opposing solo aircraft highlight some of the maximum capabilities of the F-16 Fighting Falcon. The pilots perform approximately 40 maneuvers in a demonstration. Through selfless dedication, a desire to excel and a constant commitment to improvement, these leaders have channeled their efforts into making the Thunderbirds what they are today. More than 120 enlisted personnel, representing nearly 30 career fields, form the backbone of the Thunderbirds. “Performing For The First Time In Milwaukee!” The F-35 Heritage Flight Team is officially transitioning to the F-35 Demonstration Team for the 2019 air show season taking their current flying profile to new heights. 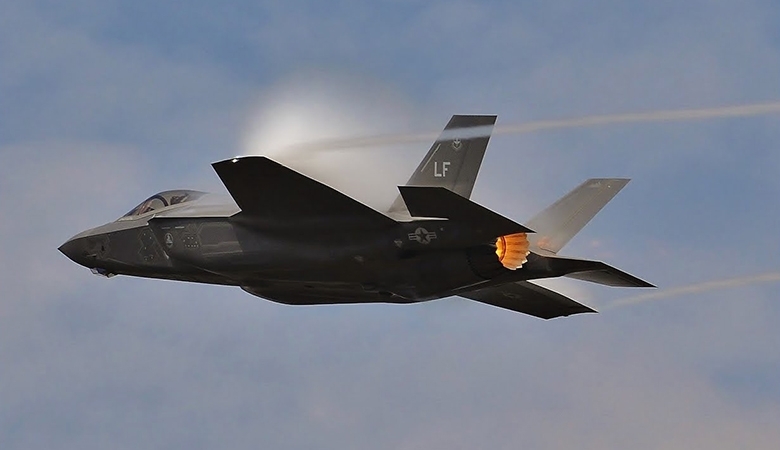 Along with the new single-jet profile, the team plans to include the Heritage Flight display following the F-35A’s performance flying alongside older warbirds representing the past, present, and future of Air Force Airpower. “Performing For The First Time In Milwaukee!” Heritage Flights seek to honor the contributions of every man and woman who has served in the USAF while educating the general public on the importance of the U.S. Air Force and its mission. 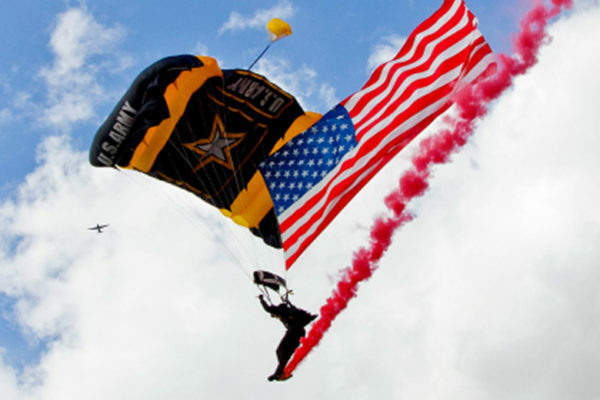 The Golden Knights are one of only three Department of Defense-sanctioned aerial demonstration teams, along with the U.S. Navy Blue Angels and the U.S. Air Force Thunderbirds. The team is composed of approximately 95 men and women, which includes four parachute units, an aviation unit and a headquarters. 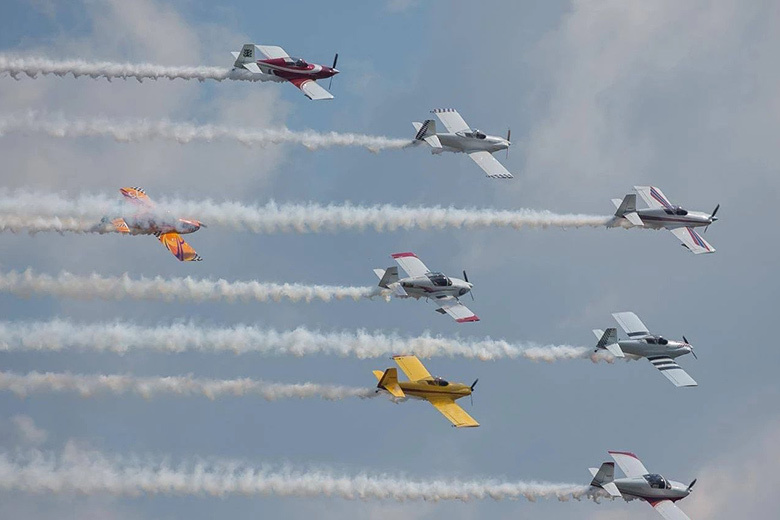 The demonstration teams, which use five dedicated aircraft, perform at more than 100 events per year. The tandem section is known for taking Soldiers, celebrities and heads of state on jumps, and the competition section focuses on winning national and international skydiving events. “USCG MH-60T Helicopter Search & Rescue Demo” Coast Guard Air Station Traverse City was established in 1946 and is a part of the United States Coast Guards Ninth District, and is situated on the southern end of Grand Traverse Bay in northern Michigan. Since 1995, Air Station Traverse City has controlled and manned Air Facilities throughout southern Lake Michigan The Coast Guard completed upgrades to its fleet of 45 MH-60J Jayhawk medium range recovery helicopters in August 2016. Redesignated as MH-60Ts, the upgraded helicopters received new flight instruments and avionics, communications and navigation equipment. Air Station Traverse City is now transitioning back to the HH-60J this summer of 2017. The Milwaukee Air & Water Show is once again proud to feature U.S. Coast Guard Air Station Traverse City, Mich. 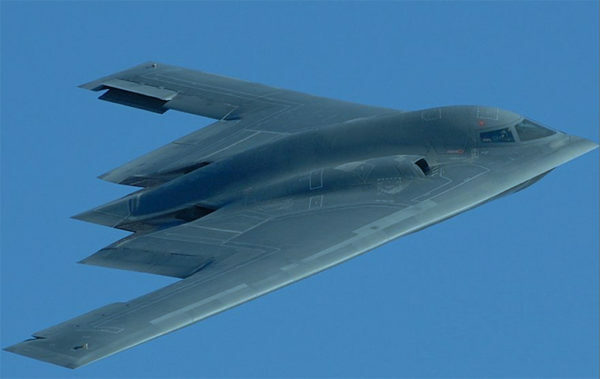 The B-2 stealth bomber, developed in the 1970’s and 1980’s, has become one of America’s most recognizable stealth plane designs among military enthusiasts. 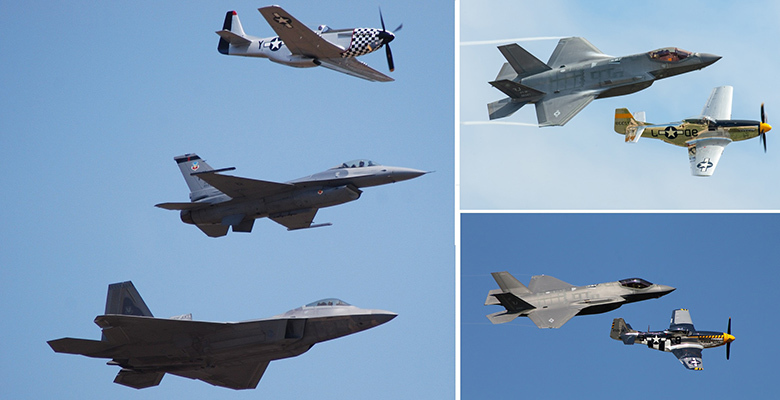 One of these advanced stealth planes will be performing an amazing flyby at the 2019 Milwaukee Air & Water Show. B-2 bombers are famed for their eerily quiet fly-by routines. The 128th Air Refueling Wing, Wisconsin Air National Guard, has had a long and illustrious record of service to the State of Wisconsin and the United States of America. From natural disasters to service in the Korean War, Desert Storm, Restore Hope and Deny Flight, the men and women of the 128th Air Refueling Wing have responded to changing world events and tasking requirements with dignity, honor and courage. 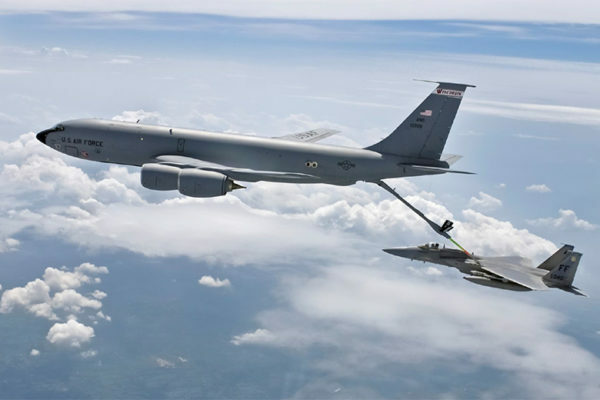 Visit the 2019 Milwaukee Air & Water Show to witness an incredible mid-air refueling using a Boeing KC-135 to refuel an F-16 supersonic fighter. The US Navy’s Tac Demo Teams are made up of actual Fleet Replacement Squadron (FRS) instructors flying the same jets used to train new students. The primary mission of an FRS is to train newly designated aviators, as well as transition aircrew into the F/A-18A-F Hornet and Super Hornet. The Tactical Demonstration or “TACDEMO” is designed to highlight the mobility, versatility and power of the F/A-18 Hornet and Super Hornet for the citizens who look to the Navy for the defense of freedom. 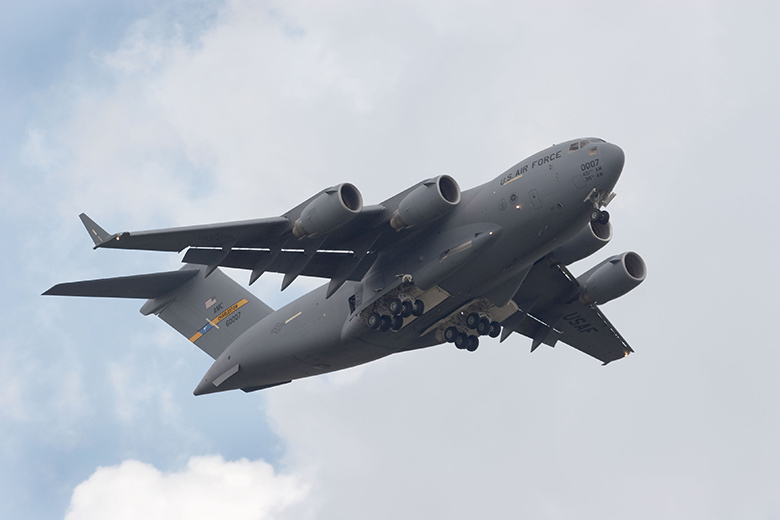 Weighing in at over 280,000 pounds and sporting a wingspan of 170 feet, the C-17 is a military transport aircraft designed for strategic airlifts, medical evacuations, and airdrops. Join us at the Milwaukee Air & Water Show to experience a flyby performance from one of these enormous aircraft. The Jack Link’s Jet Waco “Screamin’ Sasquatch” is powered by dual power plants: a Pratt & Whitney 985 radial engine and a General Electric CJ610 (J85) jet engine with 3,000 lbs. of thrust. Total thrust of the combined engines is rated at 4,500 lbs. 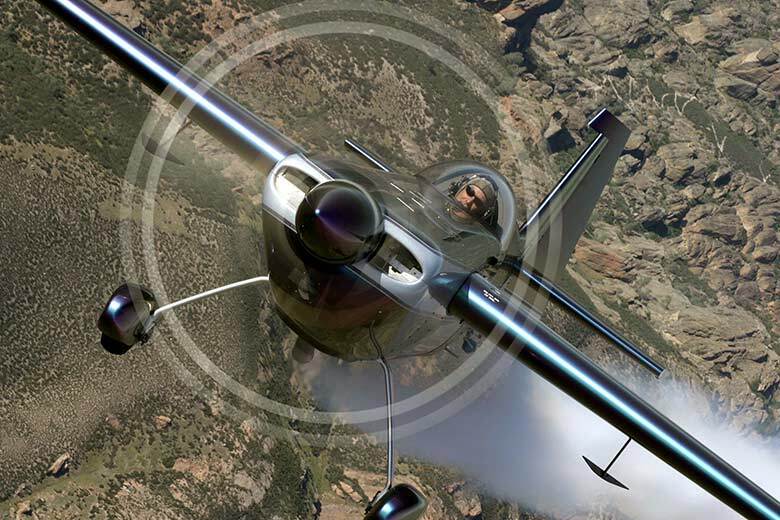 A three bladed Hartzell propeller is used to harness the power of the 985 radial. This system allows the plane to achieve feats other stunt planes are unable to do, along with reaching speeds up to 250 mph. Snap rolls, spins, barrel rolls and the hover are among the list of maneuvers this aircraft can perform. The plane has a thrust ratio of greater than 1 to 1, which allows it to accelerate going straight up. Bill’s passion for precision flying is evident in his dazzling air show routine. He trains every day so that his skills stay razor sharp, and to maintain the all-out energy and excitement he puts into his air show sequence. 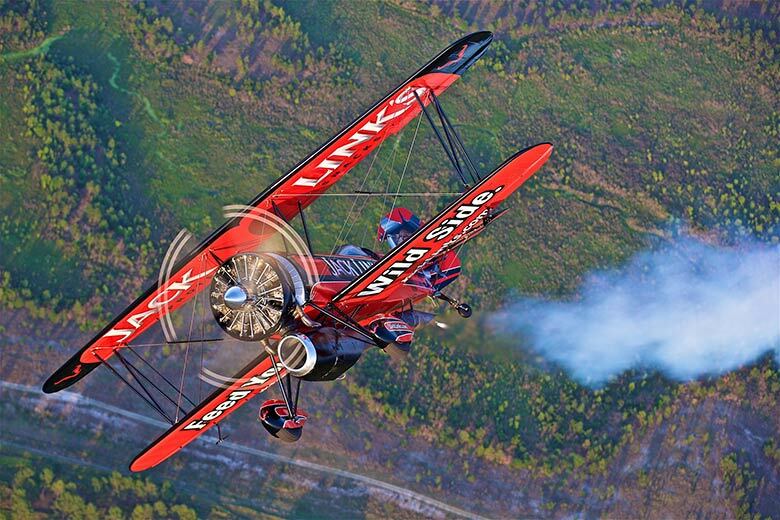 Bill’s experience includes competitive aerobatics and years of flying on the world-famous Red Baron Stearman Squadron. 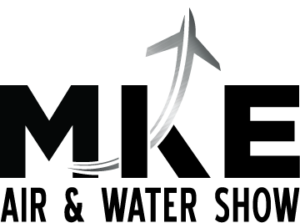 Bill also gives back to the air show community by mentoring new air show pilots including coaching the “Stars of Tomorrow” team which have performed at many prestigious air shows including the EAA Air Venture Air Show. 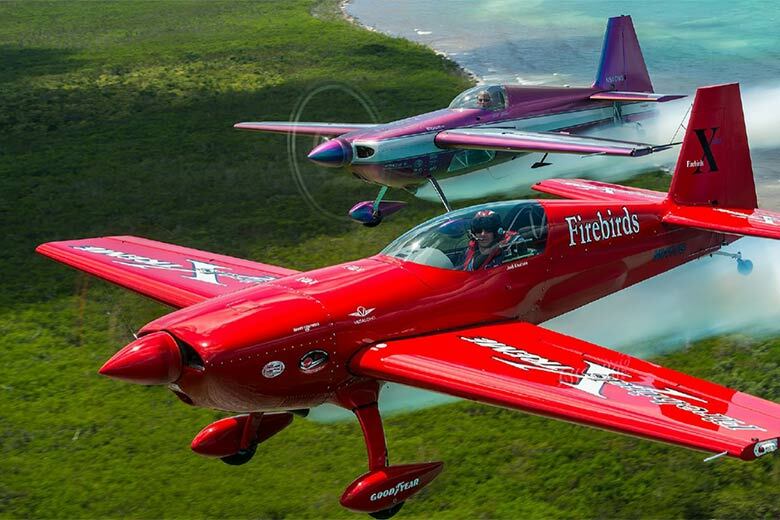 The Firebirds Xtreme are a Nationally and Internationally renowned Aerobatics team. Members Jack Knutson and Rob Holland thrill crowds from around the world with their breath taking stunts, and precision formation flying. The KC Flight Formation Team is Kansas City’s largest civilian flight formation team. 15 of their 24 team members are Formation Flying Inc. carded pilots. This year, the KC Flight Formation Team will be flying an incredible nine plane RV formation show for you to enjoy! Before you settle in to watch the spectacular Air Show, you won’t want to miss the 2019 Water Show acts performing along the lakefront! Check out all the exciting action! Badgerland Water Ski Show Team was formed in 1983 when the KeeWees of Lake Keesus and the Nagawautics of Lake Nagawicka joined forces. Today, they perform dazzling weekly in Waukesha on the Fox River and Fowler Park. Join the Milwaukee Air & Water Show for a in incredible display of on the water acrobatics! For more than 50 years the Water Bugs have performed for audiences all around the world. Their permanent home has always been in Wisconsin, the capital of show skiing. 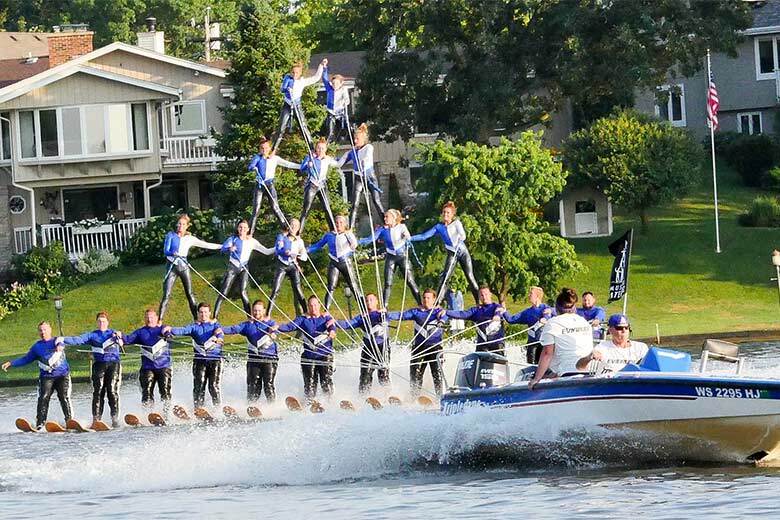 The Muskego Waterbugs have joined the 2019 Milwaukee Air & Water Show to perform a dazzling series of waterski stunts. Join us on the water for the 2019 powerboat formation demo! 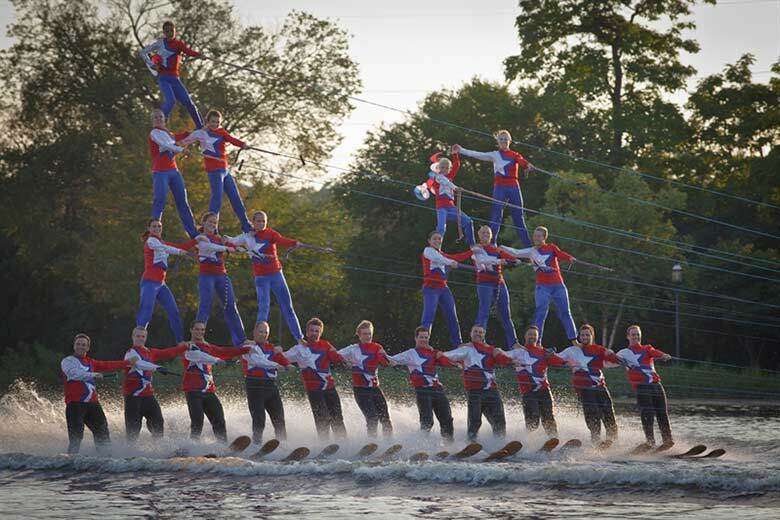 A team of skilled helmsmen will perform an incredible routine of formation stunts for everyone to enjoy. Join the Milwaukee Air & Water Show for an incredible performance from the Milwaukee Fire Department’s Trident Fireboat. The team will be performing a ‘spray demo’ showing how the boat crew fights shoreline and shipborne fires! While you watch some of the world’s best air and water show performers, there’s also lots of other things to do at the event along Milwaukee’s beautiful lakefront. We will have food and beverage vendors ready to serve your hungry tummy and quench your thirst! We are proud to feature several major exhibits at the 2019 event as well as many other sponsor displays and exhibits. 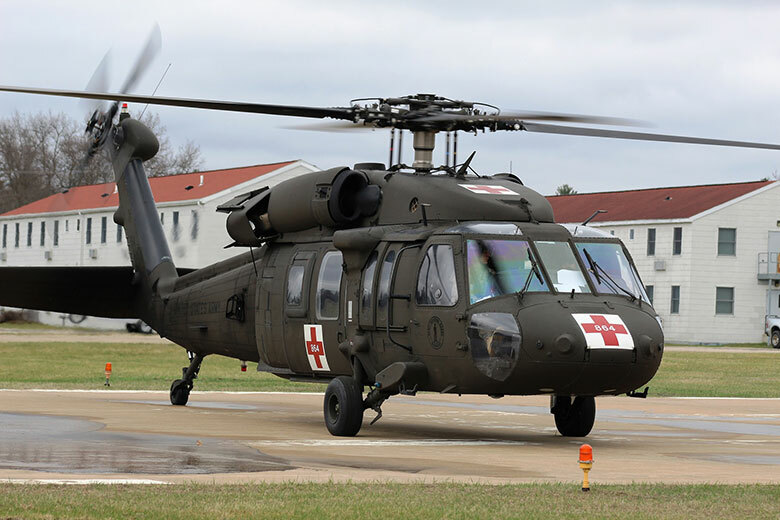 Join us at the show site to see the static display of the Wisconsin Army National Guard Aviation helicopter unit – “Badger Dustoff,” – UH-60 Black Hawk or UH-72 Lacota medevac helicopter. The Wisconsin National Guard plays an active role in global security operations, and assists with state emergencies as Wisconsin’s first military responders. A Milwaukee tradition – festivals and food! Whether you want to indulge your sweet tooth or keep the calories in check, you’ll likely find what you need that hits the spot! Please support the Air & Water Show this year by coming down to the lakefront and strolling along Lincoln Memorial Drive to visit all the delicious food and beverage vendors! Great fun for Mom, Dad, and the kids! The Milwaukee Air & Water Show will once again feature the Kidz Fun Zone at the event in 2019, sponsored by Music On The Move, which will be located in the middle of the event grounds. Great opportunity to watch the air show while keeping the kids busy! Since 2002, The Armed Forces Store specializes in high quality apparel and novelties featuring the US Navy Blue Angels, US Air Force Thunderbirds, Marine Corps, Navy, Air Force and Army. We carry caps, t-shirts, golf shirts, sweatshirts, jackets and more. We sell direct at air shows across the USA and you’ve probably seen us at a Blue Angels or Thunderbirds Air Show! Armed Forces Store is your best source for quality merchandise and air show gear. Purchase tickets today to get the best seating for the air and water shows. Reserved seating is located primarily between the Northpoint Lot and McKinley Beach, at Center-Point. Reserved CenterPoint, Flight Line Club, and Sky Chalet VIP Seating is available for purchase. Are you interested in sponsoring the Milwaukee Air and Water Show? We offer sponsorship opportunities at varying levels, so companies or organizations of any size and budget can participate.